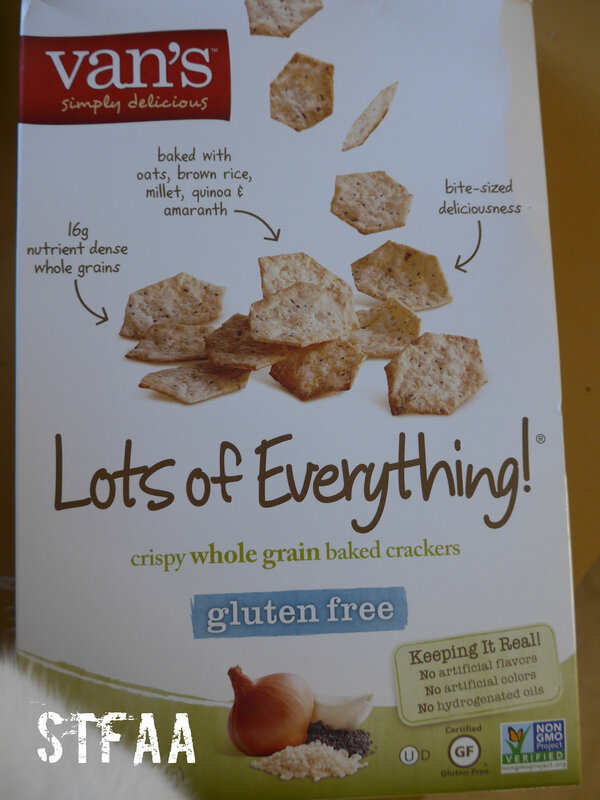 Ingredients: Van’s gluten-free whole grain blend (oats, brown rice flour, millet, quinoa and amaranth), potato starch, non-GMO expeller pressed sunflower and/or safflower oil, brown sugar, rice flour, sesame seeds, salt, poppy seeds, dried onion, dried garlic, yeast extract, sunflower lecithin, caraway seeds, mixed tocopherols. Hey, that was off-track. So crackers. These Van’s crackers have a flavor profile similar to the toppings on an everything bagel. This makes them good for snacking (decent flavor on their own), but also good for road trip food. I frequently travel with some safe-for-me lunch meats and a cashew-based spreadable cheese (review coming!) These crackers add a lot of flavor to either or both of these foods and make for a decent trail or road meal. STFAA Review summary: Great travel snack. Good flavor profile. Try these if they are safe for you. To assure our consumers receive only the highest quality products we monitor every step of our production process, and our products do not leave our facilities until all quality checks are complete. In regards to the labeling of our products, if we use a “free” claim on the box, then the product is “free” of whatever is listed. For example, “Corn-free.” All ingredients used in the product must be “free” of corn or we cannot use that statement on our products. Our labels are reviewed and approved by the USDA/FDA. There is no testing to prove a product is “corn-free” and there is no definition of that term by either of the Federal food agencies (and USDA generally has jurisdiction over only fresh foods, so I don’t know how they are involved.) If you have corn allergies or sensitivities, I’d suggest just avoiding this product — but then, you probably avoid packaged food altogether, which is safest given the lack of definition or clear labeling. This kind of a non-answer is so common from corporations, but it is disappointing when it comes from a supposedly “allergy-friendly” brand.